This pattern is licensed under a Creative Commons License and is Copyrighted 2009 by Pauline Harding. All content, including text, photos, and pattern, are copyright 2007. Contents may be copied for personal use if credit is given. 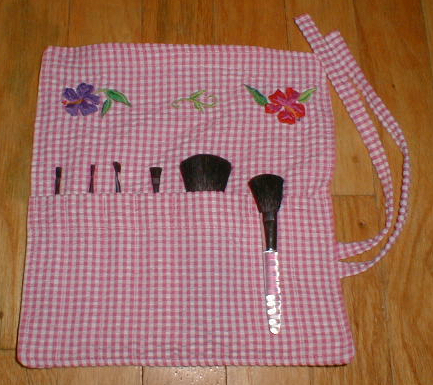 This roll-up case for makeup brushes is very easy to make, and helps keep your brushes clean and organized. Plus, it's cute! I made one from striped home dec fabric samples, and another from a child's gingham dress. Try making your own! 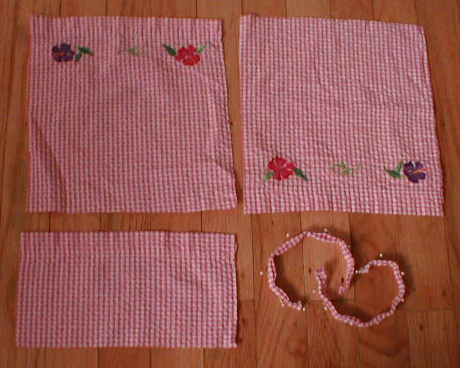 Fabric - four pieces of fabric, 8.5" x 9", or one fat quarter. 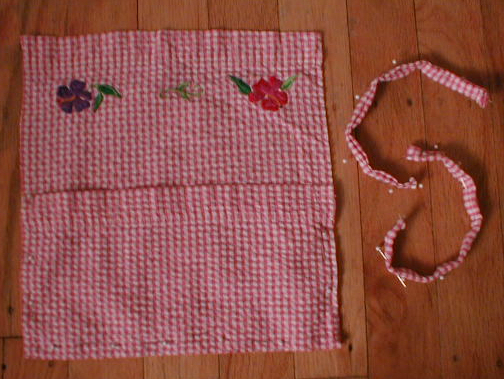 I used some samples of home dec fabric from a sample book for one, and a child's gingham dress for another. You could upcycle some fabric from used clothing, and even use fussy cutting to include decorative details from the original garment. Choose fabric that's lightweight and sturdy, but not stiff. Outside - 8.5" x 9". This is the piece you'll see when the roll is closed. Inside back - 8.5" x 9". This is the piece that goes behind the brush pocket. Ties - Two pieces, 8.5" x 1.5 ". Or you could use some sturdy ribbon. This makes a roll that is 7.5" x 8" when open, with a pocket 4" deep. Of course, the size of the pieces can be changed to make a roll that fits more or different sized brushes. Prepare the ties: Fold the fabric for the first tie lengthwise to make a piece 8.5" x 1". Press your thumbnail along the folded edge to make a fold line. Unfold. Now take each long edge and fold it in 1/2", wrong sides together, to meet the fold line you made. It will be 8.5" x 1". Now fold it in half lengthwise so that the long raw edges are on the inside; it will be 8.5" x 0.5". Pin. Now sew along the length of the tie and across the end. Baste the pocket to the inner back. Put the pocket, right side up, on top of the inner back, also right side up. Line the bottom 8.5" edge of the pocket with the bottom 8.5" edge of the inner back. Be sure the sides line up too; the pocket will come only part way up the side. 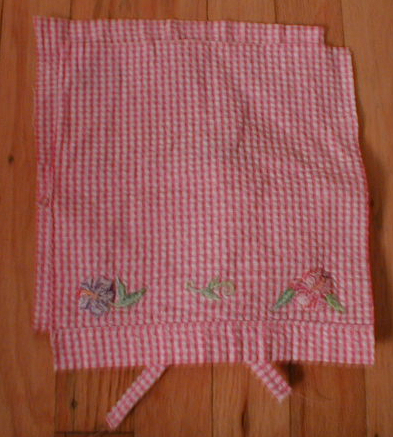 (The pocket's folded edge will be across the middle of the inside back.) Pin. Stitch around the sides and the lower edge of the pocket, using a 1/4" seam allowance. Stitch pocket compartments. Put the brushes into the pocket and pin to get an idea of the compartment widths you will need. When you are happy with the spacing, stitch straight lines from the bottom of the pocket to the top to divide the pocket into compartments for each brush. Backstitch for about half an inch at the top for reinforcement, and stitch in place three or four times to secure. Attach the ties. Lay the two ties next to each other, along one edge of the pocket, a little more than half way up the pocket, with the raw edges along the pocket edge and the ties laying across the pocket. Pin. Stitch in place, using a 1/4" seam; backstitch to reinforce. Put on the outside cover. 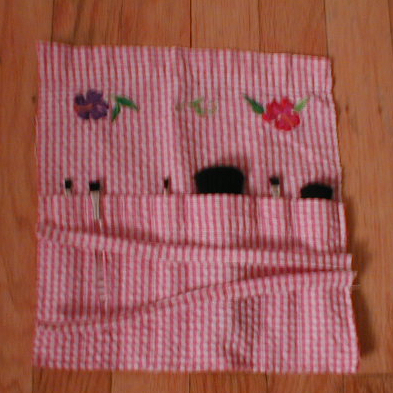 Put the outside cover piece on top of the pocket piece, right sides together. Pin. Be sure the ties will be out of the way of the stitching. (They will be sandwiched inside the two layers.) Starting on the top edge, about a third of the way to the side edge, begin stitching, using a 1/2" seam allowance. Stitch most of the way around, leaving a 3" opening along the top edge. You may want to backstitch at the points where the pocket begins and where the ties are attached, to make it more sturdy. Trim corners. At the corners, cut off a bit of the seam allowance at a 45 degree angle, being careful not to cut too close to the seam. This will help make square corners. If you like, you can trim the seam allowance to 1/4". Turn right side out through the opening. Use a blunt chopstick to poke the corners out as much as you can. Pin the opening closed, tucking in the seam allowance. Topstitch around the entire square. 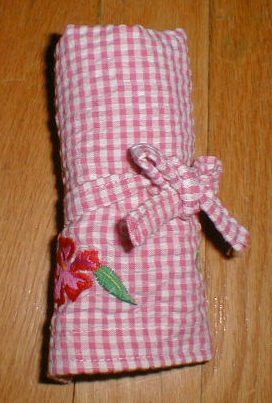 Knitting Needle Roll Variation: This pattern, made in a larger size, would make a nice roll for crochet or knitting needles. Choose fabrics that are sturdy enough to resist being poked by the needles. Tool Roll Variation: Choose a sturdy fabric that will resist dirt and grease, perhaps from an old coat or backpack, or a sturdy pair of jeans. Choose a strong strap or cord for the ties. Want a different size roll? It's easy to make your own pattern. To make this pattern, I first laid my brushes on a piece of paper. I decided where the top of the pocket should be so that a bit of each brush would peek out of the top (to make them easy to remove), and how much of a flap I needed to hold them in place. The outside piece and the inner back are the same size. In my design, the pocket is also the same size. Once I decided on the finished size, I added 0.5" on each edge for a seam allowance. So for a finished size of 7.5" x 8" I needed to cut pieces 8.5" x 9". Once you have your pieces cut, you can roll them up to see how long your ties should be; remember they need to be long enough to tie easily. You can also figure out the best place to put the ties, so that they are in the middle of the roll when the flap is folded over.